Viral pathogenesis and attenuation are two sides of the one coin and paramyxoviruses represent an important family of respiratory pathogens which permit us to study the molecular basis of each. Some paramyxoviruses infect only a single specieswhereas others have a wide host range and have a significant zoonotic potential making them attractive viruses to examine the barriers to cross-species infection (Figure 1). Measles virus is the prototypic morbillivirus which, in spite of huge progress in recent years, causes a vaccine preventable disease leading to the death of many children in the developing world every year. The virus is incredibly infectious and over 95% of a population must be vaccinated to halt transmission. Although no longer endemic in large swathes of the developed world importations lead to localized spread in unvaccinated individuals. The virus is highly lymphotropic, although it can infect neurons, endothelial and epithelial cells in vitro and in vivo. Mumps virus (MuV)is a closely related rubulavirus whichis highly neurotropic. Although it is over 75 years since MuV was identified as the etiological agent of the disease virtually nothing is known about the molecular basis of virus neurotropism and neurovirulence and molecular markers of attenuation have not been identified. A number of insufficiently attenuated vaccine strains have caused aseptic meningitis and other serious adverse events in recipients which has led to withdrawal of mumps vaccines, public resistance to vaccination, and, in some countries, complete cessation of national vaccination programs for MuV. Although nearly eliminated from most developed countries by the turn of the century, MuV has recently reemerged as an important public health issue with outbreaks occurring in highly vaccinated populations in the United States and The United Kingdom. MV and MuV are restricted to humans whereas canine distemper virus (CDV) infects a wide range of species, from dogs to lions. Figure 1: Representative species infected byParamyxoviridae. 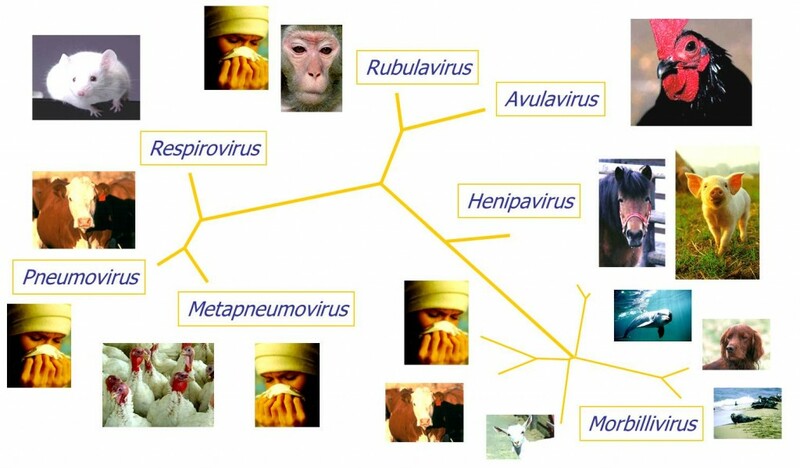 Chicken: Newcastle disease virus (Avulavirus), horse:Hendra virus (Henipavirus), human:measles virus(Morbillivirus), mouse: Sendai virus, (Respirovirus), human: mumps virus, (Rubulavirus), human:human respiratory syncytial virus(Pneumovirus) and chicken: avian metapneumovirus, (Metapneumovirus). Prototype viruses are provided as examples. Paramyxoviruses are enveloped viruses with a negative stranded RNA genome which is encapsidated by the nucleocapsid (N) protein (Figure 2). Genome transcription and replication is carried out by an RNA-dependent RNA polymerase which is comprised of the phospho- (P) and large (L) proteins. The basic unit of infectivity is the ribonucleoprotein (RNP) complex. When viewed by electron microscopy this has a herringbone-like structure and virions are pleomorphic. The matrix (M) protein associates with the cytoplasmic tails of the fusion (F) and hemagglutinin (H) glycoproteins. The ectodomains of these two glycoproteins project in homo-oligomeric spikes from the virus membrane and are responsible for virus-to-cell fusion and receptor binding respectively. Figure 2: Schematic representations of the genome organization and virion/RNP structure of MV. 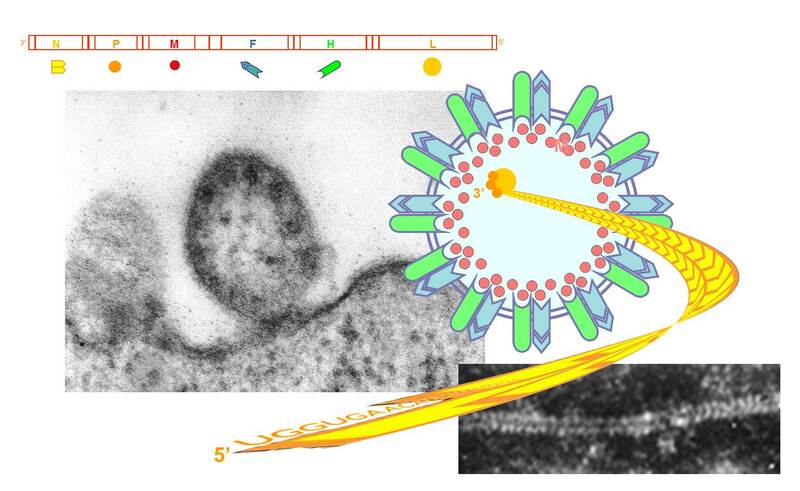 Electron micrographs show a virus budding from the surface of an infected cell and the herringbone shaped RNP within the cell (adapted from Rima and Duprex, Journal of Pathology 2006). Our laboratory is proficient at generating recombinant (r) paramyxoviruses. These are used to examine viral pathogenesis, to assess the optimal route of vaccine delivery, to develop rationally attenuated vaccines and to study paramyxovirus cell biology. Viruses are engineered to express green or red fluorescent proteins from an additional transcription unit (ATU) and we examine cell-to-cell spread in vitro, ex vivo and in vivo using high resolution, live-cell confocal scanning laser microscopy (Figure 3). We perform these studies using both vaccine and wild-type recombinant viruses and have generated reverse genetics systems for a highly pathogenic clinical isolate of MV from Sudan (rMVKS), a neurovirulent CDV (rCDVSH), the MV Edmonston-Zagreb vaccine strain (rMVEZ), the CDV Onderstepoort vaccine (rCDVOLP) and the MuV Jeryl Lynn vaccine (rMuVJL2). Understanding what makes the existing vaccines so efficacious and identifying the molecular basis of attenuation alongside identifying genes associated with the pathogenic phenotype may help to optimize existing, to develop novel vectored or to design rationally attenuated vaccines. Figure 3: left, confocal scanning photomicrograph of cells infected with a recombinant MV expressing enhanced green fluorescent protein (EGFP) from an ATU (green). 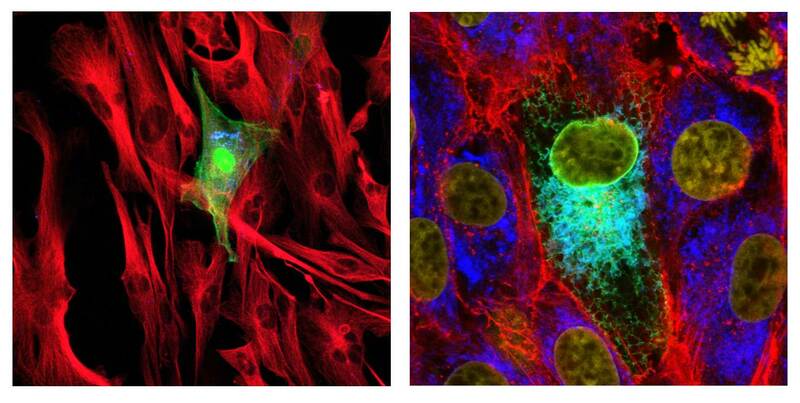 The cytoskeleton was visualized by indirect immunofluorescence using a monoclonal antibody which recognizes tubulin and a secondary TRITIC-conjugate (red) and the N protein of MV was visualized using a monoclonal antibody and a secondary CY5-conjugate (blue). Right, confocal scanning photomicrograph of cells transfected with a plasmid from which an MuV-EGFP fusion protein is expressed (green). The cytoskeleton was visualized by indirect immunofluorescence using TRITIC-conjugated phalloidin which binds to filamentous actin (red), the endoplasmic reticulum was visualized using a monoclonal antibody which recognizes protein disulfide isomerase and a secondary CY5-conjugate (blue) and the nuclei were stained using DAPI (yellow). Munday, D., E. Emmott, R. Surtees, C.H. Lardeau, W. Wu, W.P. Duprex, B.K. Dove, J.N. Barr and J.A. Hiscox. (2010). Quantitative proteomic analysis of A549 cells infected with human respiratory syncytial virus. Molecular and Cellular Proteomics,9:2438-2459. PMID: 20647383.
de Vries, R.D. , K. Lemon, M. Ludlow, S. McQuaid , S. Yüksel, G. van Amerongen, L. J. Rennick, B. K. Rima , A.D.M.E. Osterhaus, R. L. de Swart and W. P. Duprex. (2010). In vivo tropism of attenuated and pathogenic measles virus in macaques. Journal of Virology, 84:4714-4724. PMID: 20181691. Ludlow M., L.J Rennick, S. Sarlang, G. Skibinski, S. McQuaid, T. Moore, R.L. de Swart and W.P. Duprex. (2010). Wild-type measles virus infection of primary epithelial cells occurs via the basolateral surface without syncytium formation or release of infectious virus. Journal of General Virology, 91:971-979. PMID: 19923259. Sauder, C.J., C.X. Zhang, M.A.Link, W.P. Duprex, K.M. Carbone and S.A. Rubin SA. (2009). Presence of lysine at aa 335 of the hemagglutinin-neuraminidase protein of mumps virus vaccine strain Urabe AM9 is not a requirement for neurovirulence. Vaccine,27:5822-5829. PMID: 19660591. Chambers, P., B.K. Rima and W.P. Duprex. (2009). Molecular differences between two Jeryl Lynn mumps virus vaccine component strains JL5 and JL2. Journal of General Virology, 90:2973-2981. PMID: 19656963. Puri, M., K. Lemon, W.P. Duprex, B.K. Rima and C.M. Horvath. (2009). A point mutation in the mumps virus V protein disengages STAT3 targeting. Journal of Virology, 83:6347-6356. PMID: 19386700. Young, D.F., M.C. Galiano, K. Lemon, J.Andrejeva, Y-H Chen, B.K. Rima, W.P. Duprex and R.E. Randall. (2009). Mumps virus Enders strain is sensitive to interferon despite encoding a functional interferon antagonist. Journal of General Virology, 90:2731-2738. PMID: 19625458. Ludlow, M., W.P. Duprex, S.L. Cosby, I.V. Allen and S. McQuaid. (2008). Advantages of using recombinant measles viruses expressing a fluorescent reporter gene with vibratome slice technology in experimental measles neuropathogenesis. Neuropathology and Applied Neurobiology, 34:424–434. PMID: 17986184. Silin, D., O. Lyubomska, M. Ludlow, W.P. Duprex and B.K. Rima. (2007). Development of a challenge-protective vaccine concept by modifying the viral RNA-dependent RNA polymerase of canine distemper virus. Journal of Virology, 81:13649-13658. PMID: 17898047.